The contrast of green and white blooms are perfect. Native to many parts of North and South America, Carrot Weed grows to about 2 ft. in height and has soft leaves from 1-4 inches in length. Quick growing, and hardy in all zones and soils, it spreads rapidly making this a great ground cover for remediating soil pollution—Carrot Weed removes and reduces heavy metals, such as lead, from contaminated soil. This bird attractant produces fruit and seeds well in to the winter. Other names for this plant are common ragweed, low ragweed, and annual ragweed. Carrot Weed is called this because the flower resembles lace; the red flower in the center represents a blood droplet where Queen Anne pricked herself with a needle when she was making the lace. 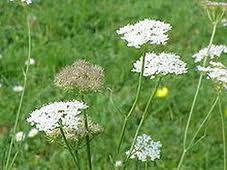 Carrot Weed was once common in traditional medicine among Native American tribes.